So has anyone been out in the last few days? I am just looking for an update. I will be out again soon just wanting to know if things are improving. Since the weather seems to be on this warming trend . Hopefully we can get 50's and some rain soon. That would be sweet. No rain til after the 1st please. Dont want the Rainy River turning into chocolate milk til then. Fishing is spotty but seems to be getting better. Was out a few days ago and got 2 Coho and 1 nice Looper. Crawler and marshmellow took them all. For those of us not lucky enough to go to the Rainy I say I want rain now. No boat and a wedding in June have made this fisherman a dry-liner way to long. Oooooh, Timbow. Congrats on the coming nuptials. Buy a boat quickly after the ceremony. Once the kids start coming, the two-seater car will go, the extra other stuff will go, but if you've got a boat before the first Jr. comes, you can always lobby your new Secretary of the Interior that you need to retain the boat, even in these trying budget times, to pass on proper values to your next generation. As a new husband, you may be the Secretary of Defense, Homeland Security, Agriculture (if you like to garden and because you have to mow the lawn), and Transportation, but the Secretary of the Interior is the real ruler. Marriage has little to do with foreign policy. Domestic issues rule there, don't you know. Never met a Secretary of the Interior in that setting who didn't want to be President. And one former Vice President likened his position to a "pitcher of warm spit." Yikes! Uh, boy, guess I digressed a bit. But then, I've gone through a few Secretaries of the Interior. They hate me now, but what I did I did for the sake of my country! Take Stfcatfish's advice and do it now. He knows what he is talking about he has had lots of experience in this area. Only thing I will say is be the President!!! Northlander, it looks like you jumped on the mallow bandwagon as well. It seems over the last couple years the crawler marshmallow combo has produced 90% of my fish from shore. I might be out tommorrow morning early for one last try before the fly rod comes out. Hey Im no fool! When I see something that looks good and it works Im not to proud to bite on it and put it to use. I used the smaller ones because thats what I had. Color didnt seem to matter. I have also used the smaller ones and done well, don't think size or color matters all that much. Hey! I just realized i hit 1000 posts! Just 100,000 more to catch northlander. Hey guys, just wanted to let ya' know that BD110 and I are planning on being somewhere on the shore this coming Monday morning. I'm hoping to break my looper-less streak. Here's hoping the weather and wind will cooperate on Monday. 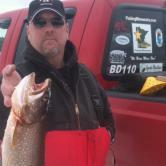 Brian I wish I could be there but I will be on the Rainy River Mon and Tues. Good luck and Ill let ya know how we do. I've always put a marshmallow in my spawn sacs and have always used a worm blower on crawlers to get them to float. A marshmallow with a crawler is a great idea, no wonder why I didn't think of that. It's been a couple years since I've shore fished for loopers so maybe its the norm there, but it's new to me. Any special way you guys rig this or is it just simply thread on marshmallow then crawler? Just slide tha marshmellow up to the eye of the hook then put the crawler on as usual and put a little air in it. Colors dont seem to matter too much as far as I have found. Thanks again Quick. Ill also be out at the French early and probably til 1ish. Let us know where you are at on Monday, We'll likely be out dragging sticks on the North Shore just want to make sure we stay clear of you guys and your ultra cast downrigger rods. What time were you planning on heading out on Monday? Think you'll need any help bonking those buggers on the head? Depends what I get done on Sunday on the rigging end of things. Count me in if you need any help as well. Good luck Randoid, let me know how you do, I plan o getting out on the river down in La crosse for a few eyes if I can shake this cold I have contracted AGAIN! What a beautiful day to be on the shore. Tried some of my favorite spots but all I could manage to catch was 1 looper and several Coho misses. Dang thigs will saw down a crawler half with the best of the perch wont they? Oh well maybe tonight after my meeting. Cant waste these type days. I don't think i can resist going out today, just too nice outside. I think I'll leave Duluth around 2 if anyone wants to meet down there. Northlander, if you head back down give my phone a call. It's Just before 3:00am I'm getting ready for an early morning trip up to the French. If you see my truck stop by and say hi. I was to your left as you look at the lake. I was just bast the tree that jets out from the bank along the ground. I was the only one past that point that landed a fish during the morning. I left the spot around 11:20am or so. I was able to land a Coho around 6:45am. There was one other person between us that landed a Coho that I saw. I don't remember the time. If you see my truck again I usually try and fish the same area. I wear Black Carharts and have been wearing a Northland tackle ball cap. Stop by and say hi.